Front Chromed ABS Plastic Hub Cover for Trucks with a 10 on 225mm bolt pattern. These Northstar™ covers fit Ford F450 & F550 (10 Lug) and Dodge Ram 4500 & 5500 Trucks. The center piece pops in and out easily to accommodate those with manual 4x4 wheel drive. 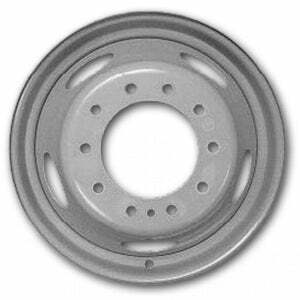 Chromed ABS plastic hub covers for medium and heavy duty trucks with 19.5" wheels. The covers are easy to install and snap onto the lug nut. Got a 4x4? The center piece on the front cap pops in and out easily to accommodate those with manual 4 wheel drive. These Northstar™ covers will enhance the look of the polished aluminum wheels on your truck.